One of the most outspoken and provocative personalities in sports television will deliver the keynote address for MTSU’s Black History Month Wednesday, Feb. 17. Stephen A. Smith, a featured commentator on “ESPN First Take,” will speak at 7 p.m. in the Student Union Ballroom. His appearance is free and open to the public and will be followed by a brief question-and-answer session. On “First Take,” Smith exchanges verbal blows with former Dallas Morning News and Dallas Times Herald sports writer Skip Bayless on various sports issues of the day. Smith also writes regularly for EPSNLA.com and ESPNNY.com, and since September 2014 has hosted the daily two-hour “Stephen A. Smith Show” on SiriusXM’s Mad Sports Radio. 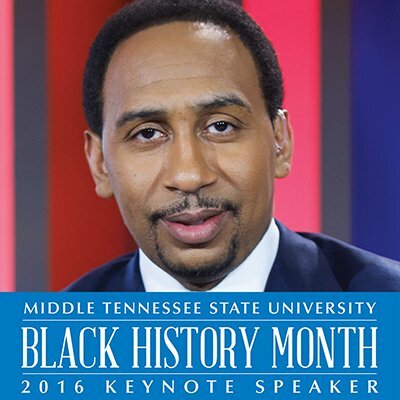 “Stephen A. Smith is a pre-eminent voice within the African-American community and is an emerging media go-to who adeptly applies his savvy insights into the world of sports to society at large while drawing parallels to such issues as race relations, politics and current events in America,” said Daniel Green, director of Intercultural and Diversity Affairs and chair of MTSU’s Black History Month Committee. Smith has held various analyst and host positions within ESPN’s television and radio empire over the years, as well as sports talk-radio jobs in New York and Los Angeles. Before moving into broadcasting, Smith worked as a columnist for the Philadelphia Inquirer from 1994 to 2010. His resume also includes stints as a reporter with the Winston-Salem (North Carolina) Journal, the Greensboro (North Carolina) News and Record and the New York Daily News. For more information, contact Green at 615-898-5812 or daniel.green@mtsu.edu.